Hey, I'm working on putting together a small business to resell EPP foam and my own foam planes cut out with my foam cutting CNC. The first items available will be sheets of EPP foam both #1.3 and #1.9. My question to everyone is what thickness of EPP does everyone typically use or would like to see? Also, What length and width is typical? There will be some limitations of size and thickness due to the machines used. There is also about a 10% deviation in thickness when cutting the foam. I hope to have the sheets ready to sell by the end of June, maybe sooner if everything falls in place. Thanks for your input, suggestions, and help! I would think that 2" is a good choice of thickness. I have held off from using EPP specifically because it is so expensive. I cant tell you how many times i have gone to flyingfoam.com and added a bunch of stuff to my cart just to find out shipping is so expensive. Hopefully you can compete with them. Right now i just use homedepot foam as its so cheap, even though its going to get destroyed in a crash. $19 for a sheet of 4' x 8' x 2". Also, i am about to build a cnc 4 axis hot wire cutter, so I would be interested to know what some large amounts of epp would cost to ship, once you get your site up. I have searched off and on over the past few years and cant find even one place that will give me pricing. I started out using the Lowes foam too. I still do. It is actually quite resilient and repairs well with some gorilla glue. Wow, your Home Depot foam is a lot cheaper than ours. I pay about $35-$40 for a 2" sheet at Lowes. Looks like I might start looking at HD for my prototyping foam. I am getting my EPP from a local source, so that will help me compete with some of these other websites. I won't be paying for shipping to get the huge bricks to my place. My only cost will be gas and time. I have a Foam Casualty CNC that has both a hotwire and a mill on it. I love it! You could probably build your own hotwire CNC for cheaper, however they did all the work and have a mill on it. They also have plugins that work with Sketchup and makes everything so much easier to design. I just got my first quote on the EPP. I had questions that will probably get answered on Tuesday. Then I place my order and pay for the first shipment. I should have some foam for sale in about 2 weeks, I hope. I have no clue what shipping is going to cost yet for me to get this to my customers. I was hoping to start looking into this over the weekend. What state are you located in? Maybe I can do a search for pricing and get back to you on shipping costs. I paid for hosting of my website yesterday. There should be something to look at now, but nothing about what I'm doing just yet. I'm hoping to do that either Saturday or Sunday. I've never worked with Wordpress or Woocommerce yet. This will be another learning experience. I'm also trying to decide the best way to ship. I'm guessing I'll need to buy some cardboard boxes and ship it that way to be sure they don't get messed up by handling through USPS, UPS, or Fedex. ...added a bunch of stuff to my cart just to find out shipping is so expensive. Hopefully you can compete with them. I just looked at your profile and saw you are from CA. USPS and FedEx claim it would cost me about $12-$13 to ship you 1 sheet of #1.3 EPP that is 36" x 24" x 2". I'm still not sure how much I will be charging for the EPP sheet. I should know more next week after I get my quote back from my vendor. I think I can be competitive on pricing. I bookmarked your site a couple days ago, not sure how the coffee and food pics tie into a foam company, but will keep checking it periodically. Hahaha, the coffee and food pics are default wordpress stuff. I'm working on the website this weekend. It is now looking a bit different. I'll admit it looks amateur because, well, I'm an amateur wordpress person. haha. I just need something that works for now. I'll work on making it look better after it is functional. I got my quote back today, I'm going forward with my first purchase. I should have foam available for sale in less than 2 weeks. I'm also planning to work on the website a bit more. I'm not happy with the theme or how everything is working together with the shopping cart. I'm hoping to get to this on Sunday. Today we received our Purchase Order. I will be picking up the foam the middle of this month. If everything goes well, this first batch will be available for purchase by Monday, 18 June. I've made a lot of progress updating the web page today. Most of it is on the back end. I changed the theme too. I think this one is cleaner and all the links and buttons work correctly. Later this week I plan to populate the #1.3 EPP Foam area with the correct information and pricing. I received confirmation that my first order will be ready for pickup on Monday, 11 June. Then I will be cutting everything down to size for resale. I updated the website with more information. I now have the sizes that will be up for sale. I also have pricing. This might change, I'm not sure yet. I still haven't figured out how to ship without charging a ton for the packaging. Right now it looks like $4-$5 for a box. That would make a shipment that cost $13 for postal service + $5 for the box = $18. This is a 36x24x6 box. I think the thinner stuff like the 3mm I might be able to roll up and ship in a tube. I have several calls out to local box manufacturers hoping I can get a better deal locally. Monday I pickup the foam from my vendor. I think I just solved my box issue for the short term. This might end up working for a long time, or I might look for another long term solution, but what I just found will help me to stay on time for selling on my target date of Monday, 18 June, and keep the cost of boxing minimal. My solution will cost about $2 for each order instead of $4-$5. Shipping costs, though, is out of my control and has everything to do with USPS for now. When I start doing more sales I can incorporate either or both Fedex and UPS. Status update on the foam. There is a delay in getting my foam from my vendor. I am pushing the date forward one week to Monday, 25 June, for having the foam ready for sale. This delay is out of my control. 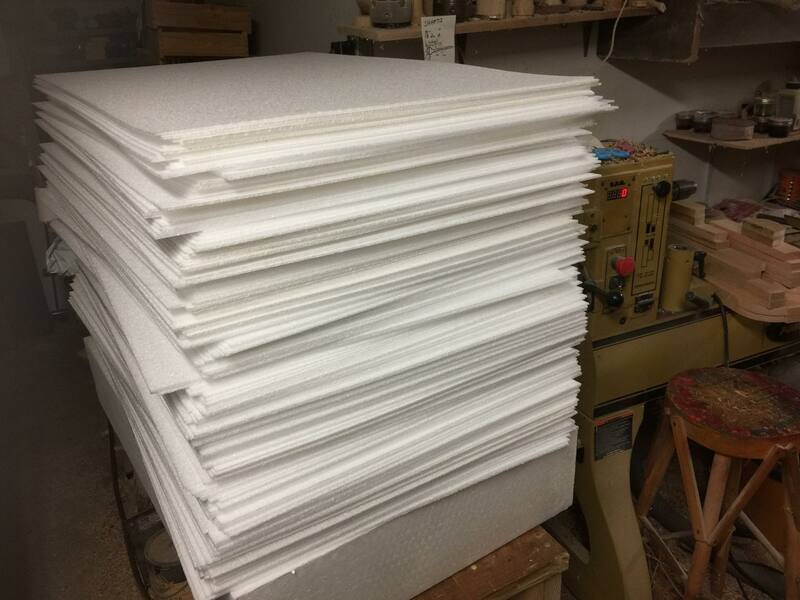 My vendor is doing their best to get the foam to me as soon as possible to include the owner said he will personally bring the foam out to me once it is ready for shipment. Over the last few days I've been going through the EPP foam. Almost all of it looks really good so far. I managed to get the 3mm foam cut down to 36" x 24" in preparation for putting it up for sale on my website and also to a few customers who already contacted me about the foam. We are officially open to sell #1.3 EPP in 3mm, 6mm, 9mm, 1/2", 1", and 2" all in 36"x24" sizes. If you would like to buy in bulk, please contact me for pricing. As of today, I now have a UPS business account for shipping. I will update my website soon to give customers another method of shipping. For the bulk orders, it might be cheaper for me to set up the shipping offline from the website. Please contact me through facebook for more details. You can find us @windcatcherrc on Facebook. Please click the LIKE button! I now have 9mm EPP. I picked it up today. Tomorrow I will cut it down to 36" x 24" and hopefully have it up for sale on the website in the evening. hi man! great job with this. how much is 2 sheets going to cost to ship to 28078? or should I say total, with the foam? Hello FTNoob18, Thanks for asking about this. I'm doing the best I can with the shipping costs. It turns out shipping cost per sheet is better when you are able to purchase a larger quantity. The issue with shipping is the size of the box. I might be able to do better if you can use smaller sheets. If you bought a 36x24 sheet, I could cut it down to fit in a smaller box. I would not charge to cut it down further. The shipping prices are approximate. I won't know exact until I pack the box and get an exact weight.